As Gervin was playing through his record-breaking season, Nike was making their first foray into professional advertising with the firm John Brown & Partners, a Seattle-based agency. John Brown & Partners launched Nike’s first campaign with the iconic “There Is No Finish Line” tag line in 1977, and they followed it up in 1978 with a series of “personality posters,” intended to capture the unique qualities of celebrity athletes. 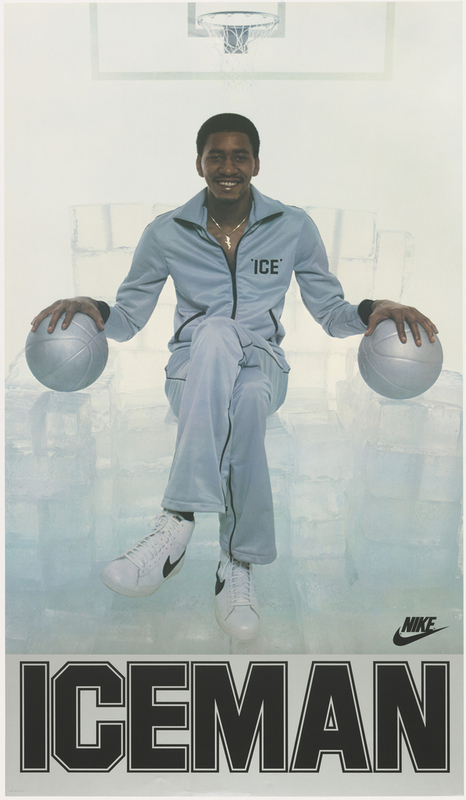 Art Director Denny Strickland photographed Gervin seated on a frosted basketball court atop a throne of ice, with a silver basketball in each hand. Gervin’s custom silvery-blue track suit was emblazoned with his moniker, “ICE,” and his feet were tilted to highlight the iconic black Nike “Swoosh” on his white high-top sneakers. The “Iceman” wore Nike, and that was advertisement enough. Gervin’s perch atop an icy throne remained, figuratively speaking, for years to come. For a time, he was the record holder for “most scoring titles of any guard” in NBA league history. Today, Gervin dedicates his time to the community of San Antonio. His popularity, and the emergence of Nike’s powerful branding campaigns, live on in this poster. Caitlin Condell is the Associate Curator & Head of Drawings, Prints & Graphic Design at Cooper Hewitt, Smithsonian Design Museum. McDonough, John, and Karen Egolf. 2003. The Advertising age, Encyclopedia of advertising. New York: Fitzroy Dearborn, p. 1141.